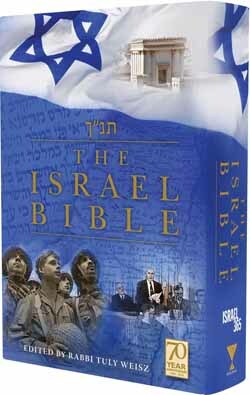 The Israel Bible is the world’s first Bible centered around the Land of Israel, the People of Israel, and the dynamic relationship between them. Designed for both Jewish and non-Jewish readers alike, The Israel Bible offers a unique commentary that seeks to explain God’s focus on the Land of Israel alongside the original Hebrew text and the New Jewish Publication Society translation. All 929 chapters highlight verses that relate to Israel, including relevant quotes and perspectives from prime ministers, as well as abundant maps, charts, and illustrations.